Changing directors again, Harry Potter And The Goblet Of Fire finds another odd choice in the driving seat: Mike Newell, he of Pushing Tin and Donnie Brasco and not a lot that hinted he might, for a brief time, come to helm the most successful children's film franchise of all time. If there's one thing you can't say about the Potter producers at this stage, it's that they went for the truly blindingly obvious personnel choices behind the scenes. As with Alfonso Cuarón on the last film, the choice pays dividends. In fact it ends up paying more than that: Goblet Of Fire is the best of the first four Potters. The structure, based around The Triwizard Tournament, gives the narrative a real grip of where it's going and unlike the previous films, you never get a sense that you, or the director, are about the lose your way and bumble into yet another potion-making class. 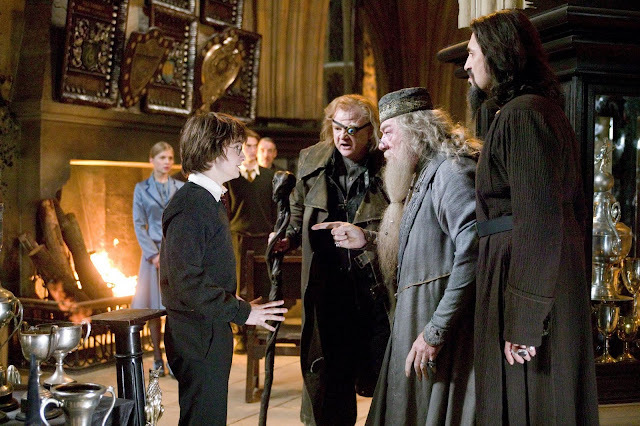 The much-needed narrative boost also comes about partially at the hands of the approaching Voldemort (Ralph Fiennes), who gets a much better defined role here than the rumours which characterised him in previous outings. Newell sets his stall out early, interrupting the now-traditional and eminently boring game of Quidditch (which, note, has now followed the sequel standard and gone 'bigger', 'louder', 'grander') to give the plot some early threat and impetus, pushing the banal sport to the sidelines as fast as a wand flash will allow him. The final reckoning in the maze and the smattering of scenes thereafter have the feel of the threat which Prisoner Of Azkaban never got the chance to realise. They are genuinely scary (arguably the series' scariest) and, beyond that, feel well crafted and justified, rather than edgy for the sake of it. The over-riding feeling come the final credits and the uttering of the immortal lines 'dark and difficult times lie ahead Harry' is the same feeling one receives at the end of The Empire Strikes Back; the alliance is fracturing, it has lost one of its shining lights, it faces an uncertain future. Delicious fantasy, with pleasing advancements and conclusions for nearly all of the characters and a final half hour which is right up there with the series' best moments. I think Goblet is a solid entry into the Potter film-dom (?) but while it gets the mood right the pacing - as with most of the films in the series - feels off. From what I remember Goblet (fire) bolts its way through the first half of the book and I think it affects the characterisation as relationships tend to come off a bit rushed/forced. Second half is pretty strong, including the ending. Also the series has a propensity for Star Wars prequel level of stereotypes/thick accents. I do wonder why people don't pick up on that more. That's true; the French are very French and the Russians are very Russian. You're probably right about the start and the momentum stops a bit when the part is reached too but other than that I really enjoyed it and each of the trials is a fantastic bit of action.